More and more, builders and contractors are beginning to understand the advantages of incorporating stone into their building projects. Whether it is used for flooring or a decorative feature, stone offers a timeless design to a structure giving it a look regal longevity that more buyers are looking for in this day and age. When it comes to building and design, preferences change. Trends come in and out in waves. Specifically with building and design purposes, just look at what was considered the popular trends throughout the ages. As preferences change, they don’t necessarily go away, but rotate over a period of decades often fusing with other time periods presenting a “new” kind of trend. One of the designs that seem to always fuse with construction trends is stone. Stone tends to always come into play when it comes to building and development because it’s resilient. The use of stone has been used since civilization began. The evidence of its durability and longevity can be seen even today. One might wonder why then, was stone phased out of building designs then? This is quite simple. Stone is heavy and back then, there wasn’t any heavy machinery that could easily mine it from the earth and carry it from one building site to another. Wood, on the other hand became the more sought after material as people were surrounded by trees—there wasn’t nearly as much development back then as it is today so forests were more plentiful. Nowadays, we have the equipment and technology to more easily extract stone from quarries. However, it is still quite a process. As a result, stone is one of the most expensive building materials in the market. Consequently, because it’s expensive makes it the most coveted. For companies who are selling stone tiles, it is recommended to have their salesmen educated about the types of stone tiles that are out there. The most familiar and expensive stone is marble, but not every builder and/or contractor can afford marble. For building companies who are interested in incorporating stone into their construction projects, but don’t want to pay the premium price of marble, there are other options. Travertine is another type of building stone that offers the same regal décor as marble. Like marble, travertine comes in different color variations, but the one distributors should really know about is Saturnia Ivory Travertine. Saturnia Ivory Travertine is a natural honed-finished straight-edge stone with ivory and cream color tones. 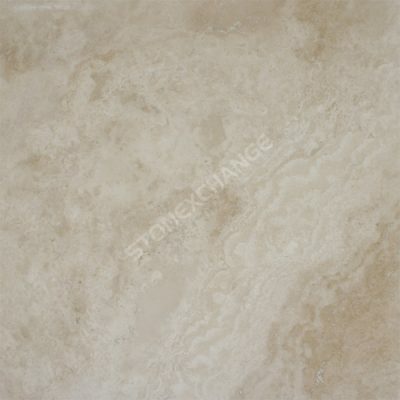 It is considered the top quality of Natural Ivory Light Travertine tile. This particular stone is hand-picked to acquire the pieces right for a buyer’s market. It is ideal for creating a neutral look to a space that would appeal to a wider array of buyers. How is Travertine Different from Marble? For one, travertine is less expensive. In comparison to the Crema Bella Marble, Saturnia Ivory Travertine is approximately $1.00 less per square foot for a 12 x 12 tile—of course, prices vary depending on where you go to supply your tile inventory. Unlike marble, travertine is not a metamorphic mineral. However, it is organically composed. Travertine is typically formed in limestone caves or near hot springs through the build-up of calcium carbonate. It’s spectrum of colors don’t range as wide as marble as it remains in the ivory and beige tones. Any slight color variations can be attributed to the veining of the stone. This depends on whether the stone was formed in the limestone cave or hot springs. It can be said that any travertine with significant color veining was created near the hot springs. From the caves come systems where algae, bacteria and organisms are formed. Thanks to these bacteria and organisms that compile over travertine during its formation, travertine becomes a porous material. This means that if builders need to think carefully about where they want to incorporate travertine into a construction project. For instance, should a builder choose to use travertine as a countertop, he or she will have to coat it with a protectant sealing to prevent any staining. Should a cook spill wine on his or her travertine countertop, without a proper sealant, that wine will seep deep into the pores of that countertop discoloring the surface and leaving a permanent stain. On the other hand, travertine’s porous properties serve perfect in other areas of a build. Bathrooms, showers, locker rooms, and yes, even the kitchen—any place where there’s water and humid conditions could use the décor and durability of Saturnia Ivory. Instead of painting over drywall, consider installing travertine instead. Saturnia Ivory also makes a decorative rustic backsplash. Another great feature about this stone is that it’s the perfect tile for outside use. Its honed finish is perfect for preventing slip and falls around pools and patios. Because of Saturnia Ivory’s neutral color tones, builders tend to want to incorporate a bolder color to break up the monotony. For creating more light to a small space, builders can install the Champagne White Limra Limestone with a design build. For a more textured look, the Shell Reef Limestone can offer an early century feel to a space as well. These are the starting prices according to Nalboor Tiles. Nalboor is a natural stone wholesale distributor located in South Florida with a warehouse stocked full of Saturnia Ivory Travertine ready to ship out today. As a wholesale distributor, Nalboor has the luxury of reducing unit prices according to the amount of inventory a buyer orders. In addition to travertine, Nalboor also has an abundant supply of the most sought after brands. Take a look at Nalboor’s online inventory. If you like what you see, call us at 305-501-4548 for a free sample today.